So, WTF, I'm posting even tho I'm still getting weird error messages cause I miss you guys!! In case you were wondering, here's a brief summary of "The Tales Of Gateway or How My Computer Ate My Brain!" 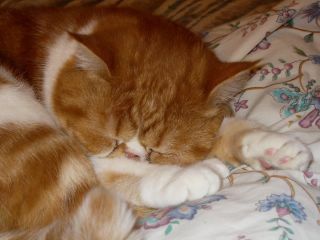 Pumpkin says thanks for reading all about him and he hopes you enjoyed his quirks...See? All that typing tired him out! Mods: I was unable to get gauge substituting the ASC for the recommended yarn so I actually knit the medium size to achieve the 48" finished measurement of the 1X size. I added 1.5 inches to the suggested length and used short rows and a 3 needle bind off for the shoulders. This was my first time using the "cabling without a cable needle" technique and I love it! I had played around with the technique before but it never "took". With every other stitch being cabled every 4th row on this shell I figured I'd give it another try and I'm sure glad I did! 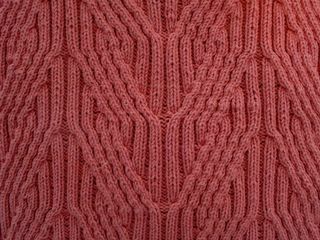 If I had to use a cable needle I'm sure I would still be knitting this! Once I started I had that AH HA! moment and off I went and I never dropped a stitch! For anyone planning to make this shell I strongly suggest you learn to cable without a cable needle too! I'm really happy with the finished product....it was fun to knit and the fit is great! The pattern, like most AV patterns is kind of "do it yourself" in that they give you the basic pattern repeats and you work out the incorporation of the decreases while keeping the cables twisting as they should. For that reason I wouldn't recommend it to a beginning knitter. I also would knit this in a light cotton/microfiber blend like All Seasons Cotton because with all the cabling this could be one HEAVY shell without the microfiber to lighten it up. Of course what would FKD be without some socks to show off? These were a fast, fun knit....I especially love the dainty picot edge altho I did mine with a provisional cast on rather than the sewn method suggested in the pattern. I also changed the heel to my standard yo short row with mini gusset. The yarn is wonderful to work with and I LOVE LOVE LOVE this color! As an aside, a commenter asked what needles I used for the Pomatomus socks from an earlier post....I've been told that the Cherry Tree Hill I used for my Pomatomus socks starts its life as undyed Gems Pearl so I use a #1 (2.25 mm) for both the Pearl and the CTH. September is my birthday month so to celebrate I'm holding my first contest!! So stay tuned for info because it involves my new project and a nice yarny prize for MY birthday! It's good to "see" you all again....the P-Man and I have really been missing you! Lovely shell - all those cables! Your cabled shell really came out great - good job! P-man looks adorable as always. Have a great holiday. 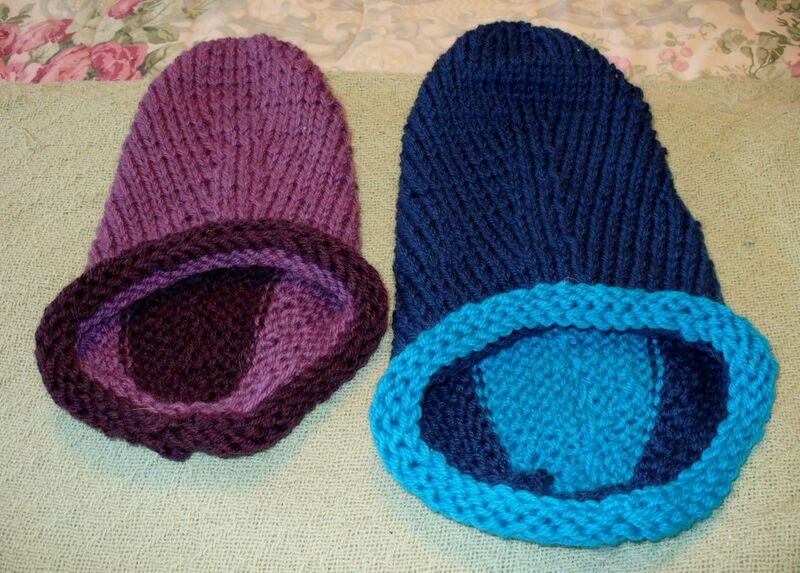 What are you going to use for the bottom of the felted clogs? 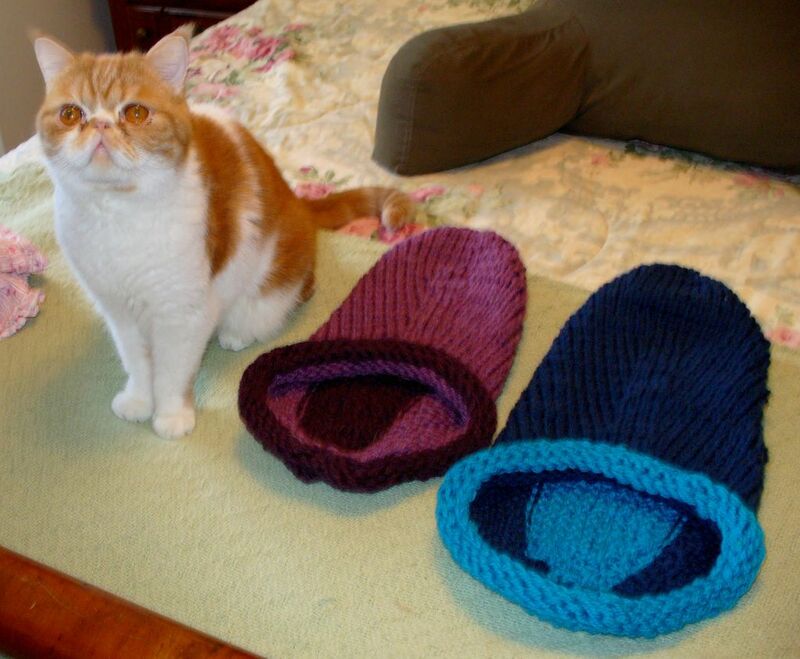 Geez, you have been knitting and keeping busy without us. I love the cabled shell and the socks. Hope the computer issues are *finally* resolved this time. Obviously the lack of a working computer has allowed you some extra knitting time! I love that vest. Stupid question, but it couldn't be an electrical problem in your house that is frying your computers? Probably just bad luck; I had a run of that myself when my new laptop crashed fatally 5 times in 18 months and so did my desktop, wiping out two years of business records for my husband's business. The backup disk was corrupted (talk about a sinking feeling when I confidently stuck it in and expected instant restoration of files and got nothing! ), so I had to reenter 2 years of transactions using bank statement and a 4-inch stack of xeroxed checks from the bank. it's great to see you and the p-man. we've missed ya both! i love the AV tank. it came out beautifully. it's funny -- i had the same experience as you with cabling without a needle. i didn't like it the first couple times i tried it and then somehow it just clicked. good luck sorting out the computer issues! Beautiful top and those socks, and the clogs are great colors too! ;o) You've been a mighty busy woman! Purdy tank top. 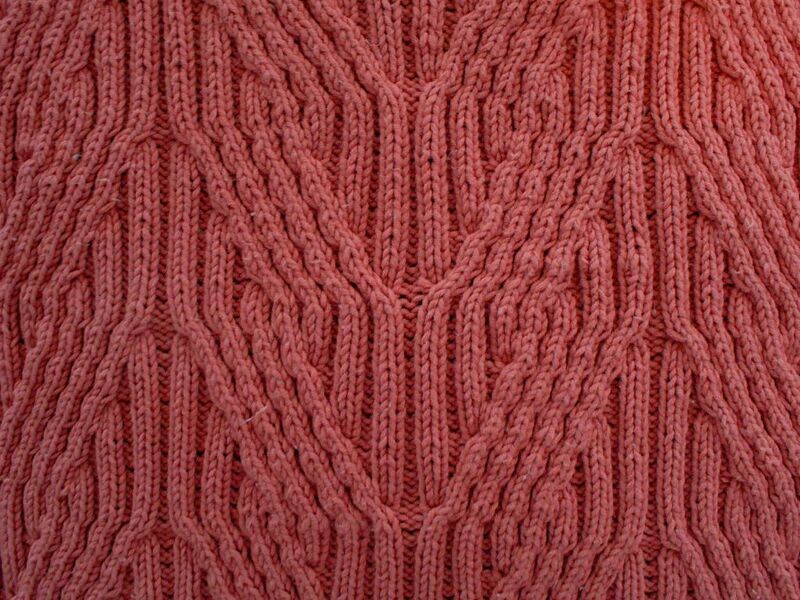 I love how the cables seem to shimmer across the fabric! Gorgeous stuff! I love that tank! Wow those are some kinda computer problems. I should think the CEO would be calling you personally at this point. L.O.V.E. your new sweater. just gorgeous and you should be very proud. I have yet to have that "ahah" moment with the cabling w/o the needle thing but I am sure I will as I embark on a sweater with many, many cables as well! Frickin' computers. Can't live with 'em, can't live without 'em. But Deb!!!! The shell!!! The socks!!! WoW. I can't get over the shell -- all those cables, and yet still looks sleek -- and the color of both -- Yummmmmmm! All verrry beautiful work, we expect nothing less from you, Ms. Debi! So diggin' the green of those socks. And rilly, my dear, ALL those cables sans needle? BTW, keep it up with the CEO! You'll have an entire (functioning?) server farm after a while. Sympathy again on your computer problems. Sounds like you're up to the challenge, though. I've always wondered how the people manage who don't have a clue? The shell is gorgeous. Hope you're admiring it often. It's a work of art - and I mean WORK with all those cables. Even without a cable needle. WOW. Beautiful shell and socks and clogs and... jeez, girl, you're setting the land speed record for knitting in the rain, hehe. But seriously, that shell is beyond gorgeous. Where did you get the AV 2006 book? I have trouble locating AV books in Florida. We miss you! :) Beautiful work. Tell the CEO to just stop all the parts switching and just give you a new fricking laptop already. 'Nuff is enough. Beautiful shell! All I can say is WOW! So glad you're back! You have to know that your name came up on a several occasions at this weekend's getaway with Lorette & Kris. You would have made a great addition to our party! I've tried the cabling without a needle with less than stellar success. Maybe I just need to try again. The shell is to die for and now I'm going to go pull out my Interweaves to look for that sock pattern. You enabler, you! Hope you get your computer problems fixed soon---dayum, that must be frustrating! Your cabled shell is absolutely gorgeous. You should be very proud. I'll have to try that yarn sometime--I like cotton yarn even in the winter, but it is awfully heavy, especially since I usually crochet instead of knit. And P-Man is such a cutie! Welcome back Debi, I missed you, read your blog FIRST when I see you have posted. Beautiful Shell, awesome socks. P-Man is a STUD! I really love that shell. I can't imagine making it with a cable needle though. Nice work! I hope you get a functional computer out of all this b.s. soon! WELCOME BACK!!! The tank is gorgeous...but my favorites are the socks...and P-Man of course!!! I really agree - forget all the "fixes" give her a NEW COMPUTER - what is it with customer "service" these days...? Pathetic that they want to send you parts...I'm getting ready to start my first pair of CTH socks, and I can't wait! WOW! What a computer story you poor dear! I love, love, love your cabled tank - the color, the cables, everything! 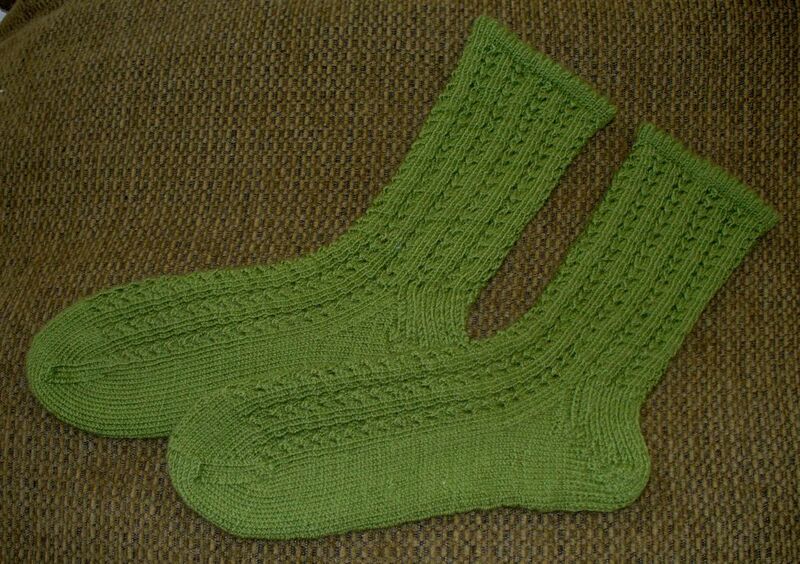 The socks are pretty too and have given me a little prompt to knit them as I've had them on my list of sock patterns since the magazine arrived on my doorstep. Nice to hear from you again! As usual your work is gorgeous, Deb. And the P-Man -- well, what else would he be but handsome? Hey there, very happy to see you again. But the problem is with me this time ... I've been trying to adapt to the new environment. It is just funny how the change of that would disrupt the whole daily routine! I'm still to find out how to incorporate regular blogging into my daily life now. But the vest is BEAUTIFUL! Nice job. 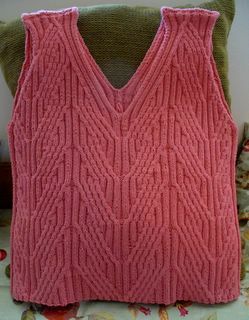 Cabled vest is just gorgeous. P.S. 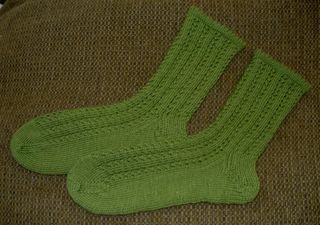 I am doing the simply lacy socks from IK too at the mo. Yours look lovely finished. That shell is gorgeous! I love it. I'm so glad you managed to finish it and not run out of yarn. You sure are brave to attack all those cables. so good that you're back. My, you've been productive. the top is gorgeous.. so many cables! I've also heard that CTH starts it's life as the Pearl, but CTH I can find easily, the Pearl is more elusive. thanks for all the inspirational photos. Sorry to hear about your computer problems. Mine has been being finicky lately and I have been debating when/what brand to go with for a new one. I have been devoted to Dell for years, but I am sick of calling in (not often, but still a pain) and getting someone I can't understand. Thank you for your good health wishes on my blog!! I am doing better, but sleeping a lot! I learned that the brain heals when you sleep, and my brain has been doing a lot of healing. I am so happy to find your blog. The cabled shell you made is fabulous. I will put that on my list of future projects! I've put your blog on my bookmark list and will visit often. ugh ok i hope this doesnt post twice - i switched over to beta.blogger. I was wondering if your laptop was a dell. I had a similar problem with my friends pc and replacing the motherboard and flashing the bios seemed to solve her problem. turns out she also had a problem with her power port. just some suggestions for your "senior" tech.